Most reservations do need to be made in advance, although we do try to accommodate walk-ins when we have the availability. Fridays and Saturdays are our busiest days and are typically booked in advance, but please feel free to call on shorter notice as we may have had cancellations. A credit card or gift certificate number is required for all new clients at the time of booking your reservations. On street parking is available on Front Street. There is additional parking in the Grace Street parking lot as well as a free public parking lot behind the Coupeville Library. To enjoy your experience to the fullest, we recommend you arrive 15 minutes prior to your scheduled appointment time. 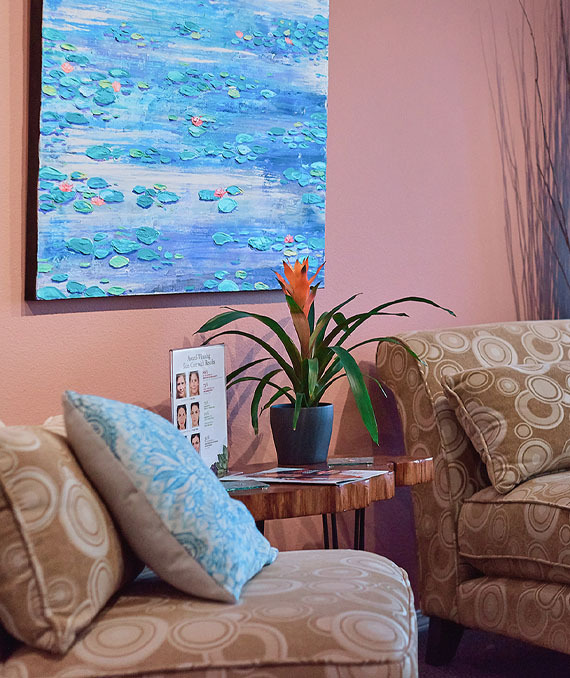 This allows you to check in, enjoy an herbal hot tea, and relax in our quiet room before your appointment time. Please understand that your treatment will end on-time so the next guest will not be inconvenienced. Late guests will receive the time remaining of their treatment. The normal fee will remain unchanged. Due to the individualized nature of services we offer, our service providers prepare treatment rooms and services in advance for each client. If you are unable to keep an appointment, please let us know at least 24 hours prior to your scheduled appointment. We reserve the right to charge for appointments not cancelled within this period. If you find that you are running more than 15 minutes late for an appointment, we ask that you call and reschedule so that we may be on time for other scheduled clients. To avoid charges please honor our 24-hour cancellation policy. Dress comfortably. Robes, towels, and sandals are available for spa guests and clothing protective coverings for hair salon guests. You may undress to your comfort level during any spa treatment as our spa professionals are trained to drape you appropriately for privacy during your treatments. We do recommend bringing sandals to wear home after a pedicure service. Certain treatments should not be performed on those with severe medical conditions or those who are pregnant. Please notify the staff when you are making an appointment of any health issues that may be of concern. We do require health history forms be filled out prior to some treatments. Your privacy is our priority, and all information is kept confidential. Some conditions may require a doctor’s approval prior to the treatment. To maintain a peaceful and relaxing atmosphere, we ask that cellular phones and pagers be turned off. Complimentary tea and purified water are available. Alcohol is not permitted in the spa or salon. Most of our treatments are suitable for individuals 13 or older with parental consent. We ask that children do not accompany you for spa treatments requiring the private treatment rooms. Generally, a 15 to 20% gratuity is appropriate and subject to your discretion. We reserve the right to refuse service or discontinue service to anyone demonstrating behavior that is perceived as inappropriate by any member of our staff. Your feedback is essential in providing you with the best experience possible. We encourage you to communicate with our staff regarding your comfort and experience.